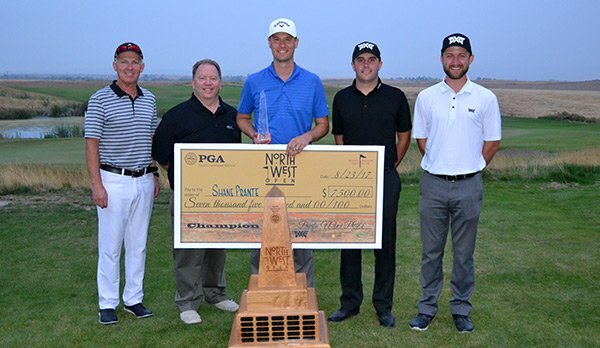 PGA Professional Shane Prante of Lake Spanaway GC won the Northwest Open Invitational with a birdie on the first hole of sudden death. Prante birdied the first four holes to catch second round leader Justin Wiles of Reames G&CC, who also birdied two of the first four holes. At the end of regulation, Prante had posted a 7 under par 65 to Wiles’ 67 to force extra holes. 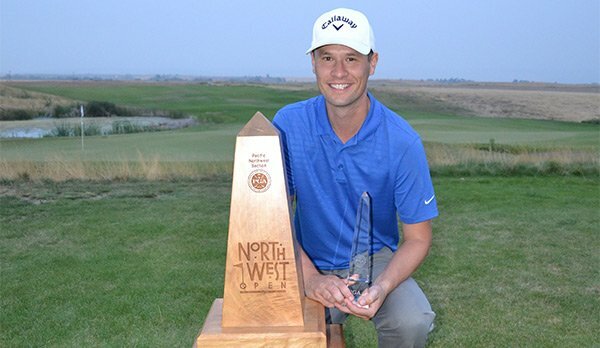 Prante then won with a birdie 4 on the par 5 18th to claim his second Northwest Open Invitational title. Li Wang of Sahalee CC was low amateur at 205. The history of the Northwest Open is as significant part of Pacific Northwest golf history. The early years were dominated by Seattle Golf Club’s Robert Johnstone (who won 8 of the first 10 events) and “Long Jim” Barnes. Barnes, the professional at Tacoma C&GC from 1911 – 1915, won the first two PGA Championships (1916, 1919) in addition to the 1921 U.S. Open and the 1925 British Open! Spokane’s Marvin “Bud” Ward captured six championships over a 22 year span, five as an amateur and his last as a professional. Bud was also a National Amateur champion and may have won a few more but for the lack of championships during WWII. To view past champions of the Northwest Open Invitational, CLICK HERE. Wine Valley Golf Club, which opened in April of 2009, has been rated 5th on Golfweek’s Best New Courses. This stunning Dan Hixson design unfolds on a grand scale, playing over rolling hills in the shadow of the Blue Mountains. Wine Valley GC had broad fairways, dramatic bunkers, and bold, undulating putting surfaces.